Dwindling stocks of raw materials, environmental issues around global warming as well as air pollution, and rapid urbanization rates in the developing world are among the challenges that engineers and scientists need to address to meet concerns and provide answers to questions over the sustainability of transportation and the future of our planet. They have certainly begun to do so. Government agencies, including the Environmental Protection Agency (EPA) in the United States, are increasingly beginning to introduce limits on nitrogen oxide and carbon dioxide emissions. Automakers are expected to be penalized if they fail to meet these limits. In 2015, Volkswagen experienced how disrespecting emerging environmental regulations may hurt brand image. In spite of the new regulations, standards, and goals in effect, opponents are right to criticize that the sources of electricity employed to power electric cars, as well as materials (including cobalt, nickel, lithium) used in car batteries are generally not taken into consideration when it comes to calculating a vehicle’s carbon footprint. Automakers around the world will have to focus on clean fuel sources and sustainable supply chains to do the term zero emission vehicles justice. Furthermore, the electric vehicle (EV) industry has a long way to go to reach the same profitability levels as the business for conventional vehicles. Today, the electric vehicle market is still heavily subsidized. 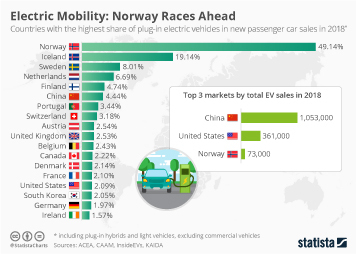 As of 2016, Norway is awarding some 20,000 U.S. dollars per electric vehicle. By 2018, the Chinese government demands that EVs make up eight percent of every brand's production. At the beginning of 2016, the global number of electric vehicles in use came to around 1.3 million units. Further information on the eMobility market can be found in the Statista Digital Market Trend Report: eMobility 2017.